Spend a day at this action-packed natural adventure park! Get ready for action at Xplor Park, a natural adventure park filled with lush jungle, underground caves and rivers, 2 zip-line circuits and a delicious all-you-can-eat buffet! These all-inclusive tickets guarantee you an adventure-packed day, with transfers from Cancun and Mayan Riviera hotels plus all your food and drinks included. Numbers at Xplor Park are limited to avoid overcrowding, so it’s essential to book your tickets in advance. 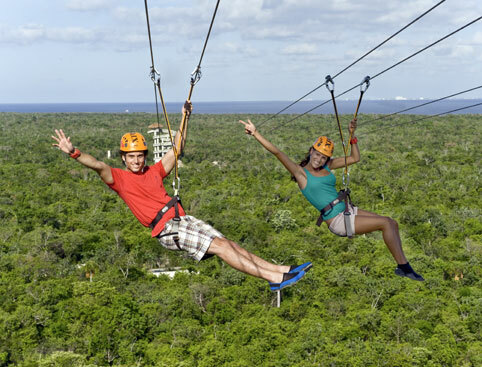 Zip Lines: Zoom down one of Latin America’s tallest zip-lining courses, with 14 different lines! Feel the wind rush past your face, take in the breathtaking views over the Riviera Maya jungle and splash your feet in the river below. 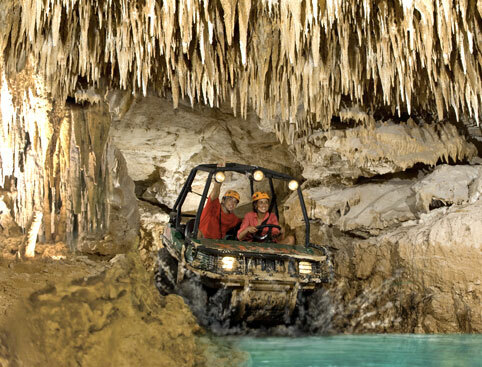 Amphibious Vehicles: Jump on-board an amphibious vehicle to drive through jungle trails, over suspended bridges and even below ground into mysterious caverns to the underground river. 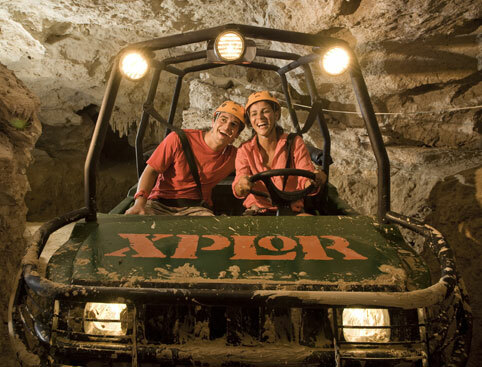 Underground Rafting: Xplor’s secret underground caves are like nothing you’ve experienced before! 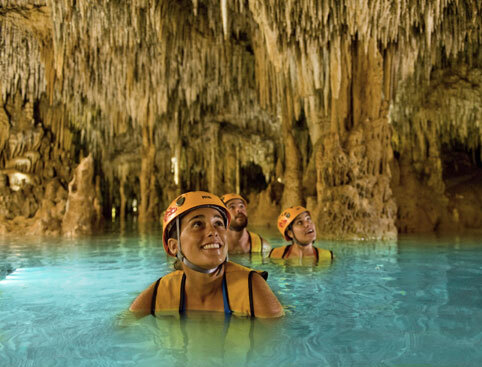 Journey deep below the surface to discover ancient underground rivers which you can swim through or explore by raft. Stalactite Rivers: The natural underground rivers are filled with incredible rock formations and huge stalactites and stalagmites formed over thousands of years – you’ll barely believe they’re real! Experience Xplor Park by Night! The adventure steps up as the sun sets and the jungle comes alive under the cloak of darkness! 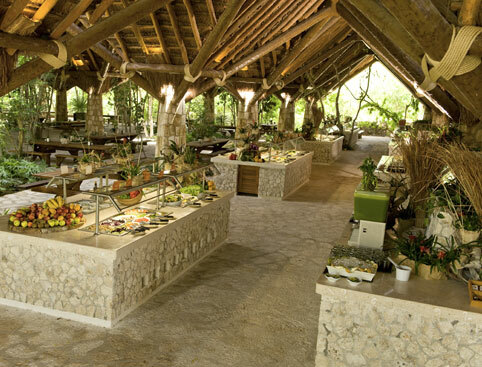 Book the Xplor By Night ticket (known as “Xplor Fuego” meaning “fire”) and enjoy the same all-inclusive activities, food and drinks as the day visitors, but from 5:30pm til 11:30pm. With return transfers included from Cancun and Mayan Riviera hotels, this is one of the Riviera Maya’s most popular night-time attractions! Xplor Park is open from 9am – 5pm. You will arrive at the park around opening time, and leave at closing time. This park is not suitable for those who are less mobile or have difficulty walking. This park is not recommended for people in wheelchairs, pregnant women or those who suffer from diabetes, heart problems, epilepsy, asthma, hypertension or claustrophobia. Sunscreen must be biodegradable and free of chemicals to avoid harming Xplor’s natural environment.